I am writing this because I had suffered in silence for too long and I know there are some out there right now going through this very thing. I know you feel trapped, alone, and perhaps too embarrassed to reach out to someone close to you. You do not want anyone to know. Why? Only you can answer that. For me, it was shame. I was too ashamed to let anyone know the situation that I had gotten myself into. It was all my fault and I was stupid to let it happen. That is the lie that I truly believed. I hated that I had become so weak and needy. I used to be so strong. I just wanted someone to love me, so I pretended that he did when things were good. And when things were bad, I drank myself through it. I regret that I suffered in silence instead of reaching out. It almost killed me. I was only able to break free because I discovered that God is real and He helped me. He sobered me up first, then gave me the courage and the strength to walk away. So now, what I used to keep a secret, I openly share because I want others to know that suffering alone does not have to be. You do not have to be trapped. You too, can be free. I have shared in older posts that I was in a mentally abusive relationship. It caused severe emotional trauma. I never knew that love could hurt the way it did. It is not supposed to be like that. For the longest time I was so alone and ashamed and I did not believe that mental abuse was really abuse so I kept my mouth shut and allowed it to continue. But I was so wrong. It is abuse. I saw someone put it this way in a recent blog: “Abuse doesn’t always manifest as a black eye or a bloody wound. The effects of psychological abuse are just as damaging.” I could not have said it better myself. It is the truth. All that time I was silent, I had wished I was getting hit thinking that it would help me to cry out for help. That makes me sad today because I think there are others thinking that as I write this. I was able to break free before the first hit came. I believe it was just a matter of time before it did. I say this because of an evil explosion of anger that came that really put fear in me like I had never known before. It wasn’t something I caused, but because I was there, I suffered for it. Then I heard the words “I warned you about my anger.” Hitters usually say that, don’t they? Thankfully, I will never know. Because I was too weak to break away (after all he did tell me he loved me), I endured his abuse for too long. I was in too deep. I did not know how to let go. I believed that nobody else would ever love me. I convinced myself that I was damaged goods and that no one else would ever want me, so I stuck around and kept taking it. And as for reaching out to someone on the outside, I would rather have died from alcohol poisoning or from mixing alcohol with pills than admitting to anyone the horrific things that I was allowing to happen to me. Now that I have God in my life and I am 100% sober, I know that it was never love. This guy was a master manipulator and being that I was such a lost soul with zero self-esteem, he caught on to that right away and used it. Boy, did he use it. I get teary eyed when I go back there in my mind and remember how it was. After the newness of the relationship had worn out, I found myself slowly becoming more afraid of him. I was afraid to speak. I was afraid that I would say something that he would turn against me. I remember an instance when we were talking about something he was going through and all of a sudden I was accused of saying something about him that he took offense to. He then proceeded to tell me that he needed to take a step back and examine my character. There was another time where I was with friends, men and women, for a gathering that I had asked him to go to. He did not go, but of course he called me and because he heard a man’s voice in the background I was suddenly accused of cheating on him. I’ll never forget that hole he ripped into my heart later that night. I tried contacting him after the party and he hung up on me and shut his phone off. Later, he decided to send me a text and said “I hope you’re happy with your new boyfriend.” My tender and already broken heart sank even more when I read that. He had shut off his phone again so I couldn’t respond or call. That was torture. There were so many times when I had called where he would answer, but wouldn’t say a word and would hang up on me. He would later explain he was working or something — we were in a long distance relationship at that time. It was craziness that I kept going back for more for. Other times if I did or said something that he didn’t like, I would find myself getting intense silent treatment. I remember one time I just sobbed because I didn’t even know what I had said or done to deserve it. He would just shut down on me with no explanation. Then there was the intimacy. I practice abstinence now, but back then I did not know God so I did not care or think much of it. What a big mistake that was. I was literally sleeping with the enemy. He was addicted and there was just something about him that managed to tear down my self-esteem even more. I had no idea that it could get me deeper into the dark pit of depression the way it did. Things got worse from there. There’s so much more I could share, but I think this is enough. Why did I stay? I have no idea. The only explanation that I can come up with today is that I was truly a lost soul. I am grateful that is no longer the case. God saved me. He not only saved my life and gave me a new hope, He gave me the self-esteem of Christ. He became my first love and this will never happen in my life again because I have a whole new set of eyes and I will see the wolves that come in sheep’s clothing. I am eternally grateful for that. I do not know if what I have shared has been any help to anyone. I am sure praying that it does help because putting myself out there like this is HARD. I am praying that someone will be encouraged — someone whose circumstance is similar to what I was saved from. Do not give up hope and do not stay suffering in silence. You too can break free, but you need God’s help to do it. There is no shame in reaching out. Reach out to God first, then reach out to others. If you do not have anyone close to you that you can trust, know that there are others out there who truly understand what you are going through. We can only understand if we have been through it ourselves. There are support groups out there and they will walk with you as you walk with God to overcome. What God has done for me and others, I know He will do for you. Cry out to Him, He is listening. You WILL overcome. I am praying for you, with all my heart. God bless. So I am 49, tired, and a freshman at community college. Am I crazy??? Why yes, I believe I am. Well, I mean that I am crazy for the God of my life. ♥ In January 2015, I took a leap of faith and started taking courses that I had quit on in the early 1990s when life became too hard and the depression and the alcohol abuse took over. God rescued me from the depression and drinking and now I have this incredible passion to walk with others suffering from things that I did for years. I am not sure exactly where God may be leading me, but I felt led to major in Psychology. I always regretted quitting school when I did, but I never felt smart enough to continue on. And not having money made it easy to forget about it. Now at this age, with a full-time job that drains me, the educational journey for me is HARD. I had to overcome the lies that I was too old to get started again. I had to overcome the lies that I wasn’t smart enough. I am truly an overcomer! I am grateful to God for that. I am grateful for my pastor and so many people who cheer me on. I heard this year that a 99 year old woman received the AA that she had longed for all her life. That really did encourage me. I am glad I am starting this at 49. There is much hope that I will continue on and get my Bachelor’s degree and I hope and pray that it will be way before I turn 99. 🙂 I am learning not to worry so much about the time. Like everything else on this journey, it’s one day at a time with God leading the way. I can’t lose when He’s leading. The more I put my trust in God and depend on Him to get me through, the more incredible and blessed this journey gets. I was never a good student back then, but I am a good student now. I am getting grades I was never able to get before. I am in awe of what God is doing. He gets all the credit because I know there is no way I can do any of this without Him. I hope this part of the story that God is writing into my life will encourage and inspire someone who has been hesitating to get started with something great because they think they are too old or not smart enough. Do not believe the lies. I am going to throw out that old familiar Bible verse that people throw out all the time because if you believe it with your heart, and you are aligned with God’s will for your life, it is SO true. Matthew 19:26 says that with God, ALL things are possible. I hope you believe it, I sure do. He is making the impossible very possible in my own life. I am always so in awe of how the Lord moves in the lives of those who believe and put their faith into action. When God first made Himself real to me, He planted a strong desire in my heart to serve Him in ministry for the rest of my life. I thought being single with no kids made me a perfect candidate to become a missionary and travel to other places and minister to the lost. My first experience was in 2011 when I went with my church to help build loft homes for the homeless in Mexico. I was hooked. It didn’t matter that I couldn’t speak Spanish. God’s love did all the talking. It was amazing. When the chance came to do it again, I was there! I remember being nervous the first time not knowing what to expect and very nervous at the thought of staying where there was no electricity or running water, but it turned out to be the start of something amazing in my new life. I was such a baby Christian then and I’ve grown so much since. I am grateful that my passion to reach the lost continues to grow stronger than ever. I thought for sure that the experience of getting my feet wet on a small scale like that would lead me to a much bigger call in missions, but the call never came. At least, not the call I was expecting. For a while, I have longed to work in a Christian environment but it hasn’t been the right time. A few years ago when my walk with the Lord was so new, I thought it was time get out of my secular job and look for something in ministry. But after some wise counsel and much prayer, God opened my eyes and showed me that I was right where He wants me. I had no idea back then that a mission field could be right where you are. God provides many “ministry moments” for me at work and for that I am grateful. I believe He has a plan to move me to somewhere else in the future. I don’t think He would have nudged me back to school if He didn’t. So I can be glad that I am still where I need to be and He is providing what I need through it. I couldn’t go back to school without a steady job that pays the rent. God is going to bring many ministry moments my way on this educational journey, I can just sense it. And as far as my longing to be surrounded by fellow Christians, He reminded me how He has blessed me with my chosen family at Hope Center as well as other brothers and sisters He continues to strategically place on my journey to heaven. I couldn’t be more blessed and more surrounded by loving Christians with amazing hearts for Him. What was I thinking? I believe I was seeing things from my own perspective and not even thinking about His. I had a desire, it was a good and godly one, but it doesn’t seem that it was coming from Him like I thought. As usual, His desire for me is even better than I could ever imagine. 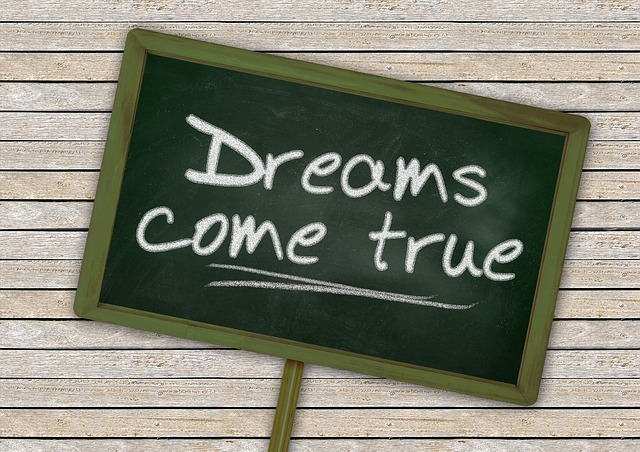 I love dreaming dreams that only my God can make come true. What a life this is. A redeemed life now filled with so much love, hope, miracles, breakthroughs, and God-sized dreams that cannot fail because He is guiding and providing. I will stumble now and then, but He never lets me go or allows me to get too far off course. Thanks for listening to my overflowing heart. I pray that if you are hesitating to do something for God that you still see as impossible, that you will stop listening to the lies and let God take over so He can take you to places you never dreamed of. You won’t be sorry. Time is going to go by anyway, right? So just go for it. I am so glad I am going for it and I know you will be too. God bless!